A 28-year-old man is brought to the ED following a motorcycle accident. The patient is unconscious and a trauma survey is remarkable for fractures of the 8th, 9th, and 10th ribs on the left side. The patient is hypotensive and has not been responsive to several liters of crystalloid fluids. 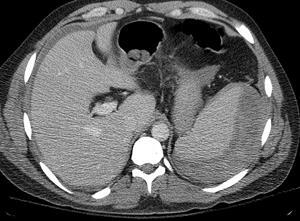 A CT scan is shown.